The 2014 model will start at $36,895, plus $1,600 destination fee (excluding tax, title, license and dealer fees). GM says if consumers include provincial consumer credits, available in Ontario, Quebec and British Columbia, ranging from $5,000-$8,231, prices could start at $29,995. “The lower price and cost savings offers Canadians the opportunity to own a Volt with an unmatched balance of technology, capability and cost of ownership,” said John Roth, vice-president of sales, service and marketing for Chevrolet in Canada. GM says Volt owners who charge regularly typically drive over 1400 kms between fill-ups and visit the gas station about once a month. “The 2014 Volt will continue to provide owners with impressive fuel consumption of just 2.4 L/100km (electric) and 6.7 city/5.9 highway L/100km on gasoline power without any need to change their daily driving habits. “Today’s Volt owners across North America have logged 364 million miles (585 million km), including 225 million electric miles (362 million km),” the automaker says. GM boasts that the Volt continues to be the best selling plug-in vehicle in Canada, outselling all plug-ins and EV’s in 2012 combined, and is attracting new buyers to the Chevrolet brand. Canada’s large urban centres (Vancouver, Toronto, Montreal) continue to be Volt’s largest markets in Canada. 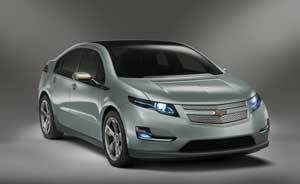 Adding to its attraction, the Volt qualifies for access to coveted HOV lanes in these markets where available. The Volt’s lower price also changes the comparative set of vehicles on popular auto information sites like Driving.ca, Autofocus.ca, Auto123.com, Wheels.ca, etc., where visitors to these sites can search for a new vehicle by type and/or prices. GM expects the lower price will broaden the Volt’s exposure to price-sensitive prospective buyers using these sites to search for a plug-in electric vehicle or a gas-powered alternative sedan. The Chevrolet Volt allows gas-free driving for 40-80 km depending on terrain, driving techniques and temperature. The range-extending engine gives the Volt up to 615 kilometres (380 miles) of total driving range. GM says the 2014 Volt will be available in dealer showrooms late this summer with two new colours, Ashen Gray Metallic and Brownstowne Metallic, and a leather-wrapped steering wheel.